There are not many teams in any sport that can match the overall success of the Los Angeles Lakers. That also carries over to the hobby as the franchise has featured some of the greatest players in NBA history. Considering the reverence for rookies cards across the collecting landscape, it is no surprise that these early cards are among the most popular cards for any player. 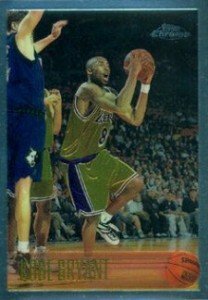 With that in mind, the following guide counts down the top rookie cards from the storied history of the Lakers. The list below is based on a combination of overall significance of the players along with the popularity and value of the actual rookie cards. It is by no means a ranking of the top Los Angeles Lakers players. Also, the criteria for cards included was based on those that played a significant role for the Lakers regardless of whether or not their actual rookie card year was spent with the team. The list includes players from the entire history of the franchise and not just from the period the team has been in Los Angeles. View our Los Angeles Lakers Collecting Guide for additional information and articles on the team. Did we leave any rookie cards out that you think belong in the list? Let us know in the comments. Although he was born Jackson Keith Wilkes, he now goes by Jamaal Abdul-Lateef and is better known as Jamaal Wilkes. After several successful years with the Golden State Warriors to begin his career, Wilkes came to the Lakers and was very productive despite being overshadowed by the many star players in LA. It is hard to be considered unappreciated while in the Hall of Fame, but if anyone deserves that designation on this list of Lakers, it is likely Wilkes. His rookie card from 1975-76 Topps is not that easy to find, but values remain very inexpensive. 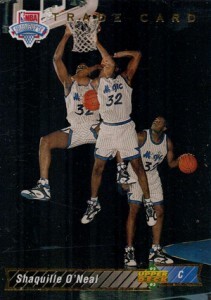 It is important to note that he is listed as "Keith Wilkes" on his rookie card. One of the most dominant Lakers in recent memory, Shaquille O'Neal may have left LA on bad terms but his contributions to three consecutive titles for the Lakers remains obvious. While his rookie cards were some of the most popular and valuable options at their release, time and the sheer quantity have brought prices way down. The rarest and most valuable rookie is his short-printed card from Upper Deck. 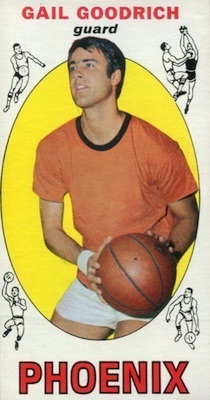 An elite scorer and facilitator, Gail Goodrich spent the majority of his pro career with the Lakers. The Hall of Fame guard won a title with the team in 1972 and is generally mentioned among the top players in the franchise's history. His sole rookie is found in the 1969-70 Topps product which features a tall boy design. Gail Goodrich's rookie card is a great budget option for a collector of the Lakers. 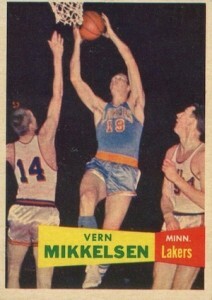 Part of the organization in the 1950s when the Lakers were still in Minneapolis, Vern Mikkelsen won four titles during his Hall of Fame career. His rookie card is found in the famed 1957-58 Topps set that also featured the rookie cards for Bill Russell and Bob Cousy. Low grades and ungraded versions of Mikkelsen's rookie can be found for under $50 despite the age and relevance of the set. Clyde Lovellette and Slater Martin are two other Hall of Fame options for the Lakers whose rookie cards are found in 1957-58 Topps. 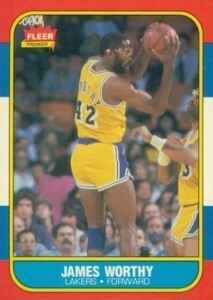 "Big Game James" spent his entire career with the Lakers ands was an integral part of the team's late-80s dominance. The main James Worthy rookie card is found in 1986-87 Fleer and outside of Mint and Gem Mint versions, collectors can pick them up for cheap. A name that is very synonymous with the Lakers, after Jerry West's Hall of Fame career he was the coach and later the general manager for the team. 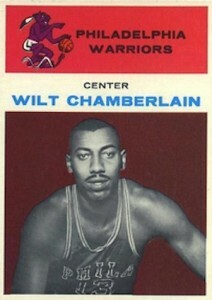 A true NBA icon, his silhouette was used for the league's logo. 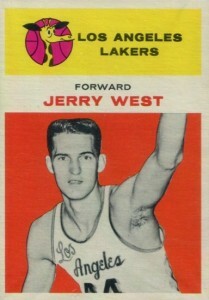 The Jerry West rookie card in 1961-62 Fleer is one of the most visually pleasing cards on the list and a hobby favorite. Although he did not make his way to the Lakers until the end of his career, Wilt Chamberlain's time with the Lakers is remembered fondly. His rookie is also found in 1961-62 Fleer. From a value perspective, it is the top choice, but in regards to the Lakers organization, West and Chamberlain could easily swap places on the list. 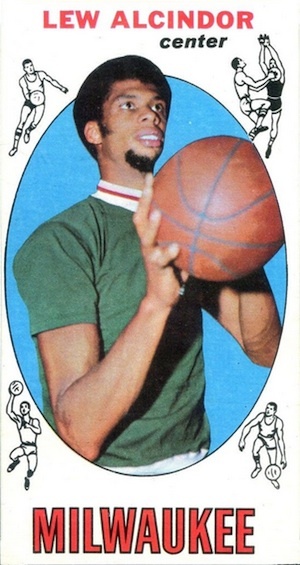 Known as Lew Alcindor on his cardboard debut, he would later become Kareem Abdul-Jabbar and one of the greatest Lakers in history. Abdul-Jabbar won five titles with the Lakers and three league MVP awards while dominating like few could. 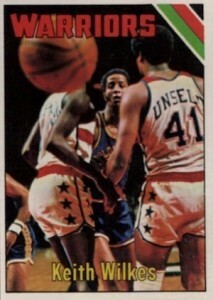 His tall boy rookie card is on a short list of the most popular and valuable basketball rookie cards of all-time. The most current card on the list, few can question Kobe Bryant's relevance to the team. 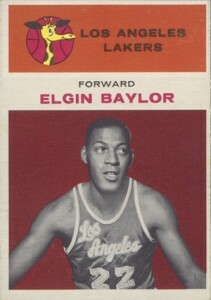 His spot among the top rookie cards for the Lakers can be attributed to the limited nature of the retail-only release of Topps Chrome in addition to his great success. Refractors are the biggest draw and prices for the rare parallels run well into the thousands. With five NBA titles, three Finals MVPs and three league MVPs, Magic Johnson is the only player that can rival Kobe Bryant in terms of Lakers accolades. However, when it comes to rookie cards, the result is much more clear. 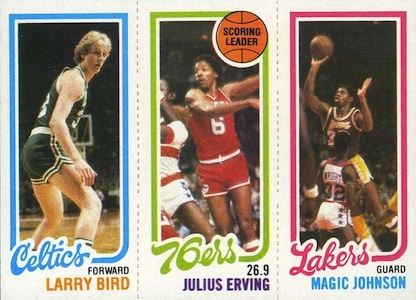 One of the top rookie cards in all sports, this iconic trio includes the rookie card for Larry Bird and a veteran card for Julius Erving. Magic Johnson also has three other rookie versions with different player groups and cheaper price tags. 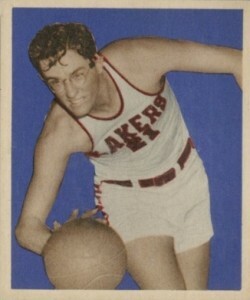 While the debate will likely continue to rage whether Kobe or Magic is the top overall player for the Lakers, the George Mikan rookie card in 1948 Bowman takes the number one spot in the hobby. It is easily the rarest and most valuable card on the list and something of a holy grail for vintage basketball collectors. JOSH HART LOS ANGELES LAKERS 2017-18 PANINI PRESTIGE RAIN ROOKIE RC VARIATION!!! 1961 fleer wilt chamberlain Rookie Psa 8.5 STUNNING! !